Hamilton was on his second attempt to bush-hog the field across the street. The first time he was interrupted by a mighty thunderstorm. He hadn’t gone but a few times round the field when he saw an animal out of the corner of his eye. 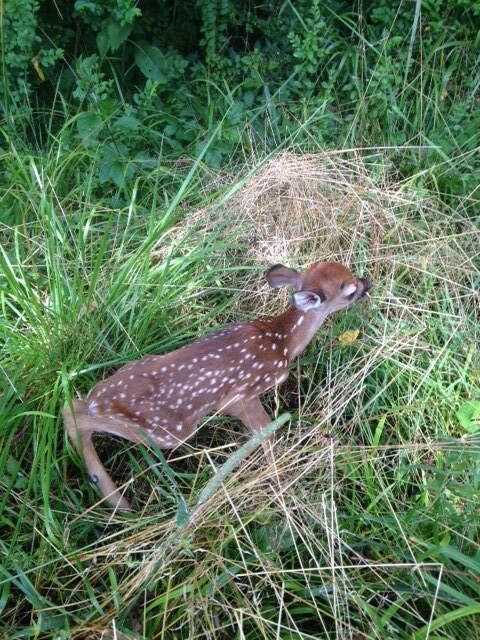 He first thought it was a rabbit but then on closer inspection saw that it was a new fawn. The mother had hidden the little guy in some tall grass and it was too young to walk around on his own. He called me and I came to see what could be done. I called the local vet school and talked to a wild life specialist. She said it was too young for them to take so we agreed that I move him out of the 90 degree heat to the shade and hope the mother returns. I carefully wrapped him in a towel so I wouldn’t touch him and moved him about 20 feet to the shade. Only the size of a long legged Chihuahua, he was delicate and beautiful. I couldn’t believe I was picking up such a tiny baby. We left the area in hopes mom would come back soon. I did some internet research and was reassured that we did the best thing for his survival. It is rare to see such a tiny one since the mom usually has them well hidden. Hamilton went back a few hours later and was distressed to see him still there but on my way to check on him we were lucky enough to see the mom bounding around nearby. We left the area with hopes that mom would find him and he would live to be a magnificent buck. I sent Alexandra a picture of the little guy and this is her return text. “TOO MUCH TOO MUCH IT HURTS OMG OMG PLEASE BABY DEER DON’T DIE”. When I told her the plan she sent this text “Okay good. Keep in mind; I am willing and able to raise him as my own.” A kind offer but unfortunately illegal so we left him to his mother’s care and took the tractor out of the field so we could give him time to grow. A week later Hamilton went to finish the field and saw the little guy up and around and able to run out of his hiding place and saw the mom in the creek bottom, a happy ending to the story. In the language of animal totems, deer means gentleness and a new innocence being born in you. I like to be reminded of gentleness, we all need to be gentle with ourselves and each other. There is far too much harshness in this world. The doe keeps her baby hidden and nurtured until he is strong enough to be in the world. We too need to keep our deepest experiences, new insights and joys hidden and nurtured, away from the harshness of criticism and ignorance until they are strong. Alexandra doesn’t want to talk about her Camino experience with her friends, she wants to keep it her private joy, safe and nurtured. So try a little gentle love on your spiritual journey so your heart can have the space to be safe and grow into something magnificent. This entry was posted in Animals by theperpetualpilgrim. Bookmark the permalink.